It was back to school for thousands of university students heading to classes at Thompson Rivers University in Kamloops, and the Kelson Group team was there too! 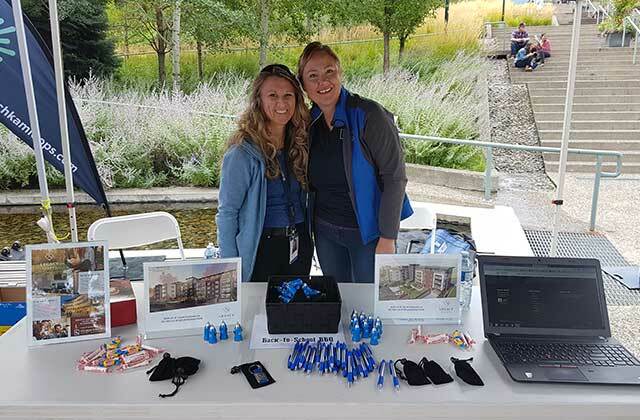 Our team was on hand to provide information to students, faculty, and staff on our rental apartments within the city of Kamloops and to talk about our newest apartment rental building – Legacy Square at TRU! We are excited to work in collaboration with The Reach at TRU who have an incredible vision to build out 90 acres on the TRU campus. Legacy Square is under construction and will be a brand new, 77 suite, five-storey multi-family development offering walk-able convenience to the entire TRU campus and some of the most spectacular views of Kamloops and the North and South Thompson valleys. Well-built, sound limiting construction, underground parking, and elevators are the finishing touches which will enable our residents to live better at Legacy Square.